Five Star Bath Solutions of Bismarck delivers the highest quality materials and professional bathroom remodeling services, while respecting your time, space, AND budget. We provide five star quality bathroom renovations WITHOUT the five star price. Period. From bath accessories and enhancements to bathroom remodels, we deliver beautiful bathing space transformations to your home all while being Clean, On-Time & On-Budget - Guaranteed. We proudly serve Bismarck, Mandan, Minot, Washburn, Lincoln, Dickinson and all surrounding areas. For a limited time GET 10% OFF! when you schedule online for your free In-Home Consultation. Professional bath remodeling in Bismarck for new showers, tubs and more. We provide affordable Bismarck bathroom remodeling solutions and a detailed quote for your consideration in the comfort of your home. Serving: Bismarck and all surrounding areas. “Five Star Bath Solutions of Bismarck is amazing! They were so helpful in choosing options. Workers were respectful and did a great job. Bathroom looks amazing!! - Gina R., Bismarck. “We usually do not give highest numbers for any work done but these people were excellent. franchisee was a wealth of info. Workers were wonderful workers. They only took 1/2 hours lunches and I do mean 1/2 hour. They never took any breaks. I would recommend them highly. - Vincent A., Bismarck. Step One: Contact us via phone or complete our online form. This simple step will bring you closer to the bathroom of your dreams. Our efficient staff will contact you to arrange a free estimate at your home. Step Two: Our estimator will visit your home at a time that’s convenient for you to draw up a plan and budget. Again, this estimate is complimentary. You are not obligated to commit to us after the free estimate is complete. Step Three: If you choose our services, our efficient installers will arrive at the scheduled time. They will have all the materials needed for your bathroom transformation. Our installers have back-up materials to deal with any unusual renovation circumstances. At the end of the job, your bathroom will be ready to enjoy. Five Star Bath Solutions of Bismarck has provided extraordinary services to our customers for 20 years. We have mastered the art of serving our customers in the best possible ways. Our hard work and honest services have paid off. We now serve in 30 different locations across North America. Five Star Bath Solutions of Bismarck can create an astonishing new bathroom at minimal price. We have services for all customers and we serve each one of them with utmost respect and honesty. Our contractors are genuine and offer high quality workmanship. Call (701) 809-0090 to learn more about our incredible bathroom remodeling services. Take advantage of our free, in-home consultations and estimates today. Call us at (701) 809-0090! Having your bathroom remodeled doesn’t have to be a scary prospect. Five Star Bath Solutions of Bismarck helps you to know what to expect and we work to make customers feel safe and secure about the entire process. 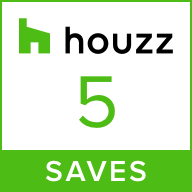 This is why we also provide a free estimate with no obligation to commit to our services. We believe in earning the trust of our customers before we proceed with the renovation. Five Star Bath Solutions of Bismarck gives our customers only the best customer service. High quality craftsmanship can be insufficient unless it’s combined with extraordinary customer service. We build a working relationship with our customers through effective communication. Once the work begins, we maintain a clean work area. Our focus on customer satisfaction is a key success factor. All you need to do is pick up your phone and call us at (701) 809-0090 for a stunning bathroom renovation. Our bathroom renovation specialists have the knowledge and expertise to help you make an informed decision. At Five Star Bath Solutions of Bismarck, our duty is to create a beautiful bathroom customized to your needs. We will treat you like family and only sell the necessary products that you need. Nothing makes us happier than a satisfied customer at the end of each job. When you call us for a free estimate, we send our local and experienced estimator to your place at the appointed time. They will talk with you about your budget and show you a variety of options from our electronic catalog. We have over nine thousand quality products to choose from. Our estimator will take measurements of your bathroom for a more accurate estimate. Once this is complete they will give you a customized quote for your bathroom remodeling job. After that, it's up to you to decide if you want to take advantage of our professional services. Contact Five Star Bath Solutions of Bismarck right away. Call (701) 809-0090 now. Just as we care for our family’s safety, the well-being and security of our customers is top priority for us. We make sure all our estimators and installers go through a complete background check and screening. Each of our service technicians have required licenses and insurance for quality and safety. Our installers follow industry installation standards to provide quality service to all our customers. We are experts about the installation process. Professional installation will assure that your new bathroom fixtures will last. Let us help you by creating the bathroom that you envisioned. Contact Five Star Bath Solutions of Bismarck to get started with your bathroom remodeling. Take advantage of our free, free, in-home consultations and estimates today. Call us at (701) 809-0090! Five Star Bath Solutions of Bismarck provides beautiful and cost-effective bathroom renovation services. We have the experience to cater to all kinds of renovation jobs, no matter the budget size. Our customers have a variety of needs and styles. We offer walk-in bathtubs, handheld shower heads, stunning tub enclosures, and more. Our goal is to take care of all your bathroom remodeling needs with professionalism and care. 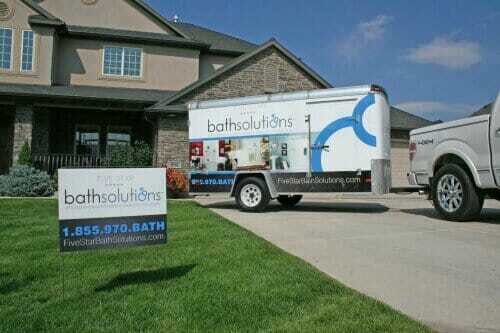 Call Five Star Bath Solutions of Bismarck now to schedule a free estimate. You need organized and skilled tradespeople to carry out your bathroom renovation. We offer just that! Our experienced and professional bathroom remodelers in Bismarck have the skill to transform any bathroom. Five Star Bath Solutions of Bismarck receives positive feedback from satisfied customers. Our customers refer their family and friends to us for their bathroom renovation needs. The solid services we offer attract more customers through word of mouth than any other method. Call (701) 809-0090 today to get the best bathroom transformation at a price you can afford. With your hectic schedule, it's hard to find a moment to unwind. A beautiful, new bathroom could transform your stress levels. Having a place to relax is beneficial for emotional and physical well-being. Our bathroom transformations can give you the perfect place to get a good start in the morning or unwind from a busy day. We offer products to improve your life. Our products cater to a variety of needs and styles. From stylish to functional, we have what you need for your bathroom remodeling needs. Always dreamed of a walk-in bathtub? Or how about a peaceful hydrotherapy bath? Contact us at Five Star Bath Solutions of Bismarck. We can make your bathroom renovation dreams a reality. Call (701) 809-0090 to get your desired bathroom remodeling job started. We hear a lot of complaints about the monotonous look of some bathrooms. Are you suffering from the same problem? Does your outdated bathroom have you feeling despondent? If that is the case, you need to contact us as soon as possible. Even a few small changes in your existing bathroom can give it a refreshed look. 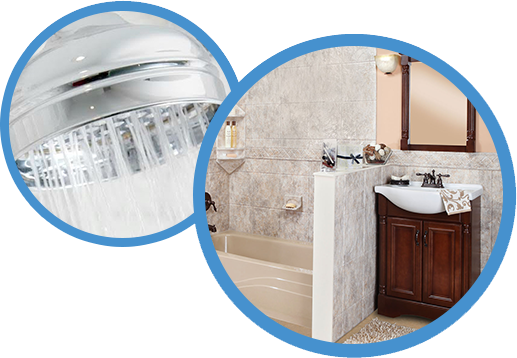 We offer a cost-effective method to get your bathroom remodeled. You can choose from our diverse range of products for your bathroom renovation. Our flawless installation service assures that your new products will last. High functionality of our products will improve your quality-of-life by transforming the time it takes to maintain your bathroom. Our products are beautiful and easy to clean. The most problematic and uncomfortable part of taking a shower can be the slipperiness of conventional bathtubs. Such bathtubs can make bath time something you dread, especially if you struggle with limited mobility. Our walk-in bathtubs are designed for a secure and comfortable bathing experience. They provide the customer with independence and a sense of security while taking a bath. 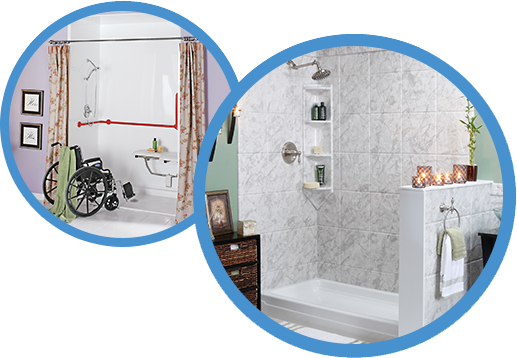 Our customized bathtubs are convenient and accessible to people with disabilities. You or your loved one can enjoy bathing independently again. Five Star Bath Solutions of Bismarck will work on your bathroom to make living your life more comfortable and independent. We get immense pleasure in bringing ease and comfort to your life. Make taking an independent bath a reality again by calling (701) 809-0090 right away. Our customized bathtubs have the convenient feature of fitting into any conventional bathtub footprint. Transporting a new bathtub through a home into the bathroom can be a difficult task. Our walk-in tubs have a patented two-piece design. This makes for a more convenient transport of your new tub into the bathroom for installation. In case you have an extra-large bathtub opening, we can install the included extension kit. Our walk-in bathtubs are a perfect blend of function and elegance. A new, customized walk-in bathtub will change the whole look of your bathroom for the better. With a new walk-in tub that improves the look of your bathroom and restores your bathing independence, you will be proud of your decision. Contact Five Star Bath Solutions of Bismarck right away and get a walk-in bathtub! Five Star Bath Solutions of Bismarck carries high quality bath wall systems. We can transform your tub or shower in as little as one day with durable materials that look like natural stone. Our solid wall surfaces come guaranteed to last for the lifetime of your bathroom without needing maintenance. Unlike tile, cleaning one of these tub surrounds is much easier because of its nonporous quality. This means there is no place for mildew or mold to start growing. Home improvement stores offer prefabricated, low-end tub and shower enclosures. But they can't beat the styles and colors offered by Five Star Bath Solutions of Bismarck. Our solid wall technology is grout-free, fade and scratch resistant. We can customize the tub or shower surround to fit the area of your original shower or tub area. As part the installation we seal the walls to make them leak-proof using quad-lock technology. These keeps the water from getting behind the walls where it could cause damage. Five Star Products are made to last using the highest quality materials. These surfaces are completely solid and nonporous, thereby preventing mold and mildew from developing. Because it’s UV protected, it’s fade proof. Our tub and shower enclosure surfaces are durable and scratch resistant, which means they will look great for years to come. The versatility of these customizable surfaces means you have the option to extend the shower or bath surround all the way to the ceiling. These tub enclosures not only make your bathroom look amazing, they also increase the resale value of your home. With the latest technology in tub surround, Five Star Bath Solutions of Bismarck can remodel your bathroom in as little as one day. We know how important your bath/shower area is to your daily routine, which is why we work hard to do the job right. Our workmanship quality is guaranteed. You can relax knowing your new tub enclosure was installed right. Contact us online today. We have transformed the lives of people by providing exceptional bathroom remodeling services. We have estimators and installers who can transform your bathroom with beauty and functionality. Five Star Bath Solutions of Bismarck has your bathroom renovation desires covered. From aromatherapy and hydrotherapy tubs, to handheld shower heads. Maybe you just want to replace your dingy, old tile with a new tub enclosure that is easier to clean. 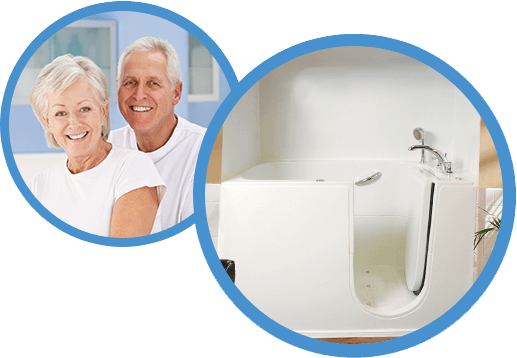 Perhaps you or a loved one need a low barrier bath solution to make daily life easier. We, at Five Star Bath Solutions of Bismarck, are happy to offer you our expert services and products. Contact Five Star Bath Solutions of Bismarck and have your bathroom transformed. Call (701) 809-0090 today. Founded by European Americans in the year 1872, Bismarck is the second most populous as well as the capital city of North Dakota State. Before the Europeans came to Bismarck, this land was inhabited by indigenous people. This city was known as "place of the tall willows". After European Americans start settling in this place, it was renamed as Bismarck. The city was named after German chancellor, Otto von Bismarck, who was a Prussian statesman from 1860 till 1890. This city was nominated as the capital of the North Dakota state in the year 1889. Bismarck is located in the middle of Great Plains and has a four-season sub-humid continental climate. The temperature of the city also remains within 37°F and 43°F all year round. The coldest month in the capital city of North Dakota is considered to be January while July is considered as the warmest month. Before you visit Bismarck, you should visit the official website of North Dakota to find more information about the climate of Bismarck city in order to avoid any unpleasant surprises. Native American, Whites, Asian and African American are the races that live peacefully in Bismarck. The average age of people living in the city is 38 years with 20% population below 18 years old. According to the US Census Bureau, the estimated population of Bismarck is a little more than 70,000. The service sector is the only sector in the city that employs most of the people that dwell in Bismarck. To be specific, healthcare service providers are the ones that employ most of the population of Bismarck. With such a heavy contribution of the healthcare sector in the state of Bismarck, the city is also considered as the center of healthcare in the entire North Dakota state. Serving: We serve Bismarck, Mandan, Minot, Washburn, Lincoln, and Dickinson and all surrounding areas. Having a hard time cleaning your shower space? Five Star Bath Solutions of Bismarck materials make your shower easy to clean and maintain, in addition to protecting your walls from water.